Here’s our author for today’s Six Question Saturday! Jeremy Rodden considers himself a dad first and an author second. He is the author of the middle grade/young adult Toonopolis series of books that take place in his cartoon universe. He also edited, contributed to, and published The Myth of Mr. Mom, a non-fiction series of essays by stay-at-home dads. You can find him here. Now… on to the six questions! If you have any questions of your own, please leave them in the comments, and hopefully Jeremy will drop by and answer them. Question 1: Is there another life experience you’ve had that you believe compares well to writing your first novel in terms of both the difficulty and sense of accomplishment? If not, what do you think might compare well? Most definitely. I’m a father of three children. I’ve had many life accomplishments of which I am proud (being a published author, obtaining a Masters in Education, overcoming major depression) but absolutely nothing stands above the pride of watching and molding my three sons into good, intelligent, and kind young men. In addition to “being dad”, I have been a stay-at-home since 2010 (right after my second child was born). Life as a stay-at-home parent is simultaneously the most difficult and rewarding job I have ever had. Question 2: Tell us about that moment you decided to actually complete a novel. Had writing been on your mind for years, or was it a sudden impulse? What did you do next? Toonopolis (my cartoon universe) was a concept I created while a senior in high school all the way back in 1999. The story that encompasses my first novel, Gemini’s Alice in Wonderland-like adventure through the cartoon world, was developed shortly thereafter. It wasn’t until I became a stay-at-home dad in 2010 that I seriously began writing the novel. I’d done plenty of writing in the past (one of my undergraduate majors was in English Writing, after all) but never before had I actually dug down and really did it. I wrote the first draft of Toonopolis: Gemini in about 3-4 months in 2010. Then I tried to figure out what next. 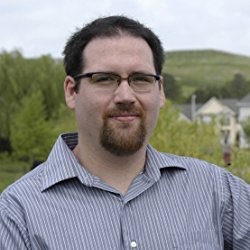 After months of querying and submissions, I began reading JA Konrath’s blog and looked into the (still somewhat new) paths available for independent/self-publishing through Amazon and others. I embraced this path and have zero regrets. I am a proud author-publisher (to borrow a term from Chuck Wendig). Question 3: What’s your writing setup? How do you take notes? What’s your process to develop a first draft? Are any tools critical to your success? 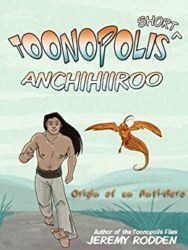 I am a pantser, at least with my Toonopolis books and stories. Since these stories are very world-driven, I don’t take many notes in advance of writing a chapter other than what the location will be (each chapter takes place in a specific sub-section of the cartoon city that is connected by theme [eg, Adventure Realm, Candy Island, Superhero City, etc.]) and a few notes (usually any characters they will meet or a joke I want to set up). After that, I throw them into the setting and see where they go. My first drafts are extremely dialogue driven. I focus more heavily on the character interactions and sometimes fast-paced witty dialogue than I do on character action/setting description. I like to go back and fill in those details on later drafts. Even then, I prefer to leave scene-setting intentionally vague to allow the reader to fill in those details with their imagination. Even in final form, my stories tend to be dialogue heavy by design. In part it is because I write humorous adventure–and humorous adventure needs jokes and not page-long descriptions of the shade of green a field is. I don’t rely heavily on tools. I use Evernote to keep notes (since it syncs nicely across devices) and Dropbox to store my WIPs (so I can work on any computer). As a busy stay-at-home, I need to steal chances to write when I can so it’s not uncommon for me to work on a piece on my desktop, laptop, ipad, and iphone all in one day. Question 4: What book or series would you most love to see made into a movie or Netflix series? What would you fear the director or screenwriter would get wrong? My own? I mean, Toonopolis is just ripe for an adaptation but I’ll answer a different series for fun. One of my favorite current indie book series is Rachel Aaron’s Heartstrikers series. I think it would be a fantastic movie series and could be done very well. My biggest fear would be that they’d focus on visuals and CGI (because, you know, dragons) than on the amazing character development and relationship between Julius (dragon) and Marci (human mage). The other fear would be that they drive straight to a romantic angle with the two of them (which, to be fair, is there… but develops extremely slowly over three+ books so far). Question 5: Can you write some verse (any form) that describes your hopes as an author? Or the theme of one of your books? Question 6: You step onto an elevator with three other people, all representatives of your core audience. The doors close. You have their attention until they get off 18 floors later. Buddy the elf is not on the elevator with you, so it’s going to be a quick trip. What do you say to convince them to read your novels? 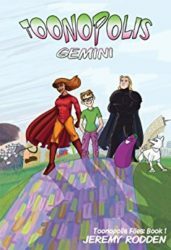 Have you ever read a novel set in a cartoon universe? I’m guessing the answer is no because, to my knowledge, I’ve written the only ones. Toonopolis is a fun, fast, easy journey through a world of humor, parody, and pop culture gags. That being said, it still has a great adventure feel and connections to our real world that cannot be overlooked. Whether you enjoy comics, cartoons, role-playing games, I guarantee there is something you would enjoy in it. Going Wide, Part I - Wide vs... Narrow? A science fantasy early chapter book fairy tale?